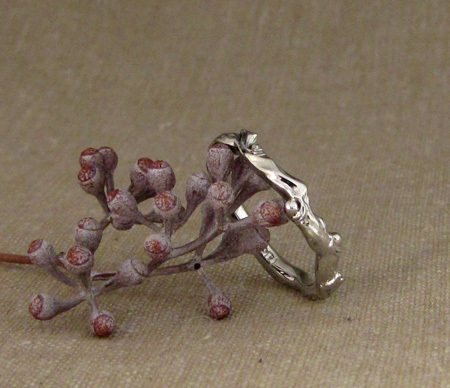 This was a delicate little branch wedding band made to snug up against my Scattered Ginkgo & Diamonds Ring. 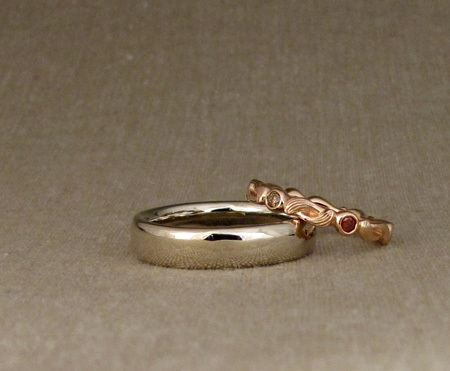 Because the recipient was not intending to solder the two rings together (thus keeping them perfectly lined up always), I made sure that the band would work when it was not lined up in its spot. 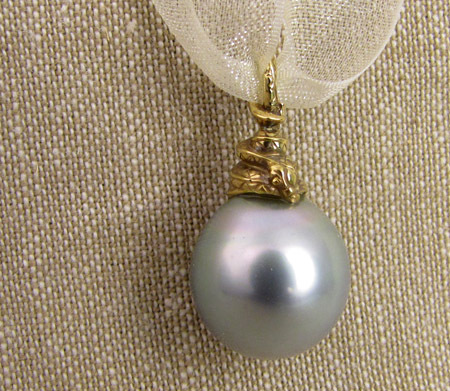 It has a breezier, lacier look when unaligned, and looks to be a part of the original ring when fit together. This is definitely one of the more unique pieces I’ve made recently, combining unusual design motifs (two alligators holding a center stone in their mouths + lettering) with multiple stones. The client specifically was after a rough-hewn medieval look. As it turns out, I’m not super good at rough-hewn (too much of a perfectionist) in that I can’t bring myself to leave hammer marks in from stone setting, or make my carvings look primitive, or whatever it is I felt might make a piece look very old. What I could do was fake it a little by arranging more prominent carve marks here and there, and the choice of 18K royal yellow gold was perfect, especially with a little patina here and there to make details more prominent. 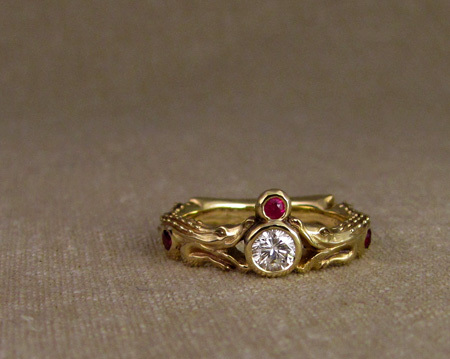 I absolutely love how this ring finished out. My alligators turned out rad! 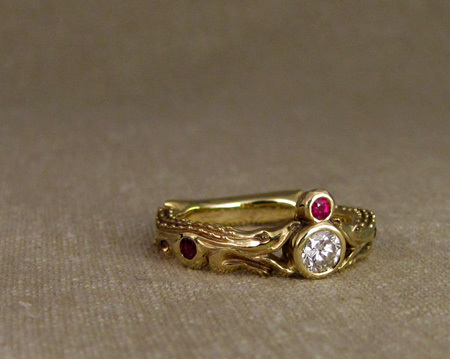 The diamond and the two belly rubies were old family stones with sentimental value, and we added a new third ruby to sit above the diamond. 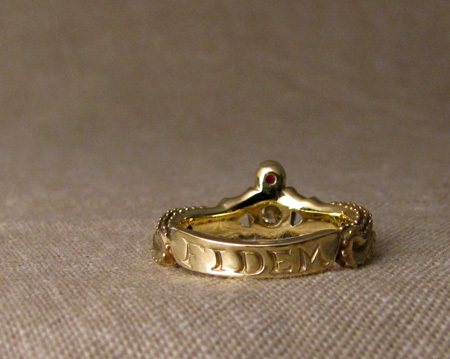 The back of the ring had the Latin “FIDEM” inscribed in. 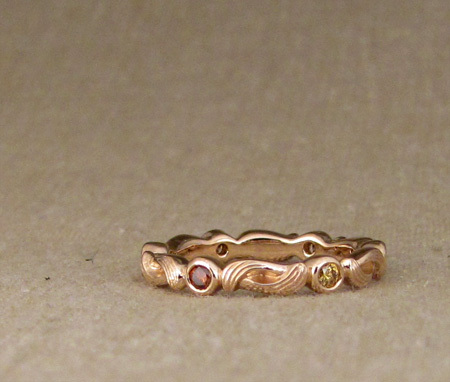 Delicate eternity band in 18K rose gold (which has such a lovely peachy hue to it). I have it set with a handful of little colored diamonds ranging from champagne to golden yellow, yellowish orange, reddish brown. The entire band is warm and wonderful. I don’t do earrings very often and I don’t know why not. 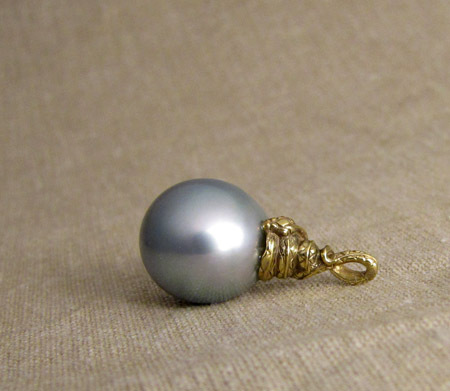 Possibly because I rarely wear them myself these days, which is amusing since I have something like seven closed-up ear piercings from back in the day. 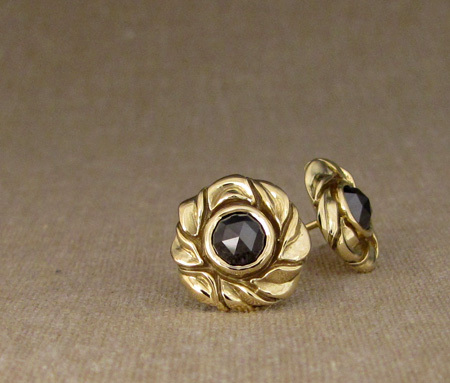 At any rate, I was excited at the chance to create a pair of ear studs using a pair of gorgeous rose-cut black diamonds encircled by a handful of carved leaves. 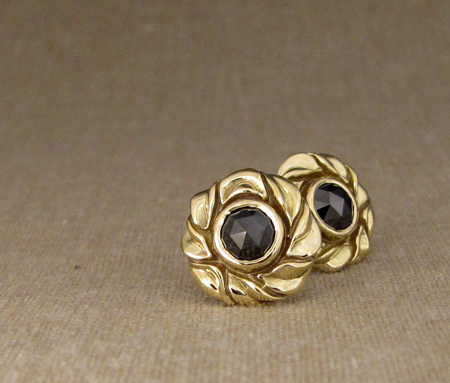 The metal is 18K yellow gold, which I think is the perfect choice to combine with a glittery jet-black diamond. Pretty pretty! !